Having released the completion to his New History Warfare trilogy in April and subsequently earned a second shortlisting for the 2013 Polaris Prize, it came with no surprise that the Island Stage tent at Guelph Lake was packed for Colin Stetson’s Hillside performance. Even if the festival horde that assembled around the stage at Hillside had done so on the grounds of base curiosity and the ambiguity of the invisible sounds provided by Stetson’s recordings failed to establish him as a force to be reckoned with in their minds beforehand, his live performance likely confirmed his status as a one-man orch-rock army. With less than an hour of stage time at his disposal, Stetson delivered only a handful of his surreally affected sax drones at Hillside Festival, but he still managed to showcase three songs from each of the latter two volumes of the New History Warfare. Opening with “Among the Sef,” the mournful alto-sax supported ode to octopi that didn’t have much luck coming on land, Stetson set the tone for the ironically elate crowd that would receive his afternoon performance. Next was another bass-sax rendered number, “High Above A Grey Green Sea,” introduced with just a brief mention of the infamous 52-hertz “Loneliest Whale In The World” cetacean whose song cannot be registered by other whales (he instructed the crowd to do their own research). Stetson has dedicated the song to the sea creature since a friend told him it called into mind the whispered stories of the elusive whale. Perhaps as a nod to the closing of his trilogy’s narrative, Stetson closed the set with the title track from New Histroy Warfare Vol. 3: To See More Light. At the end of the day, Stetson also participated in an improvised collaborative workshop with Sonic Youth member Lee Ranaldo and his new band The Dust, as well as Little Scream, fellow Arcade Fire/Bell Orchestre bandmates Sarah Neufeld, Richard Reed Parry and Stefan Schneider (read the review here). 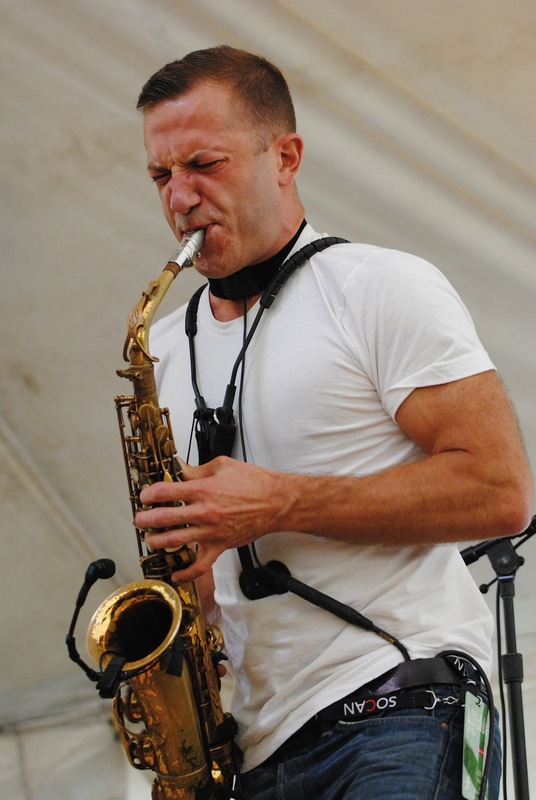 This entry was posted in Burden of Salt and tagged Colin Stetson, Guelph, Guelph Lake, Hillside, Hillside Festival, Island Stage, New History Warfare, setlist on July 30, 2013 by Tom Beedham.